Gluten-free baking can be rough. Simply replacing regular flour with the gluten-free kind can lead to dense or doughy cakes. Some recipes call for exotic ingredients like xantham gum and sorghum flour; others produce cakes or cookies that are oddly chalky or artificial tasting. After a lot of sad and failed attempts, I’ve realized that almond flour almost always leads to great baked goods. Almond flour is just finely ground up almonds that you can either make yourself or purchase at a specialty food store. In baked goods, it acts as the flour and the fat, leading to some deliciously rich results. And since almonds are good for you, it means your cake must also be healthy, right? One of my favorite gluten-free cakes is a simple almond butter cake that can be easily embellished. The batter consists of butter, almond flour, rice flour, eggs, and sugar—no hard-to-find gluten-free ingredients or things you can’t pronounce. For spring, I’ve made a rhubarb-rose version with chopped rhubarb and rose water. 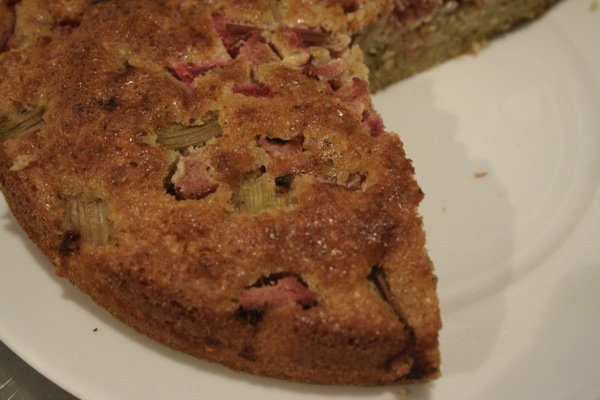 It’s the perfect start to rhubarb season and is great for dessert or breakfast. If you top it with freshly whipped cream, it only gets better. Hillary Pollak is a junior at New York University, where she studies food sustainability and alternative health. She is currently learning to bake gluten-free. Preheat the oven to 350°F. Grease a 9 inch cake pan and line the bottom with parchment paper. In a small bowl, toss the rhubarb with the 2 teaspoons of sugar and set aside. Using a stand or hand mixer, beat the eggs and sugar together until very thick and pale. Slowly beat in the butter, then continue to beat for one more minute. There will be a few small lumps. Using a spatula, fold in half of the flour mixture. Once it is almost incorporated, stir in the lemon zest and rose water. Fold in the remaining flour mixture until just combined. Pour the batter into the prepared cake tin, then evenly spoon the rhubarb pieces and any juice on top. Bake for 40-50 minutes, until the top is golden brown and a knife inserted into the center comes out clean. Let cool for 30 minutes, then serve.